Quids, or Tertium Quids (meaning "a third way"), were a splinter political group organized by members of the early Republican Party. Beginning in the 1790s, the Republicans and their principal leader, Thomas Jefferson, opposed the policies of Federalists like John Jay and Alexander Hamilton, who advocated a loose interpretation of the U.S. Constitution that threatened to grant the federal government broad powers. Republicans such as Jefferson and James Madison believed in a strict interpretation of the basic law that emphasized state sovereignty and local control. Resolutions of Virginia and Kentucky laid out the party's ideology and outlined its geographic appeal. While Federalists dominated affairs in New England, Republican ranks swelled in southern states, especially North Carolina. Jefferson's presidential election in 1800 was a great triumph for Republicans nationally, but once in office he began to modify his views on the power of the federal government. In the minds of some party faithful, Jefferson began to stray from the fundamentals of Republican ideology. The Louisiana Purchase, although praised by the majority of Republicans, led some citizens to conclude that Jefferson was exercising executive powers not mentioned in the Constitution. In 1805 these dissenters formed a group they called the Tertium Quids, who sought to remain true to the principles of strict constitutional construction and state sovereignty. 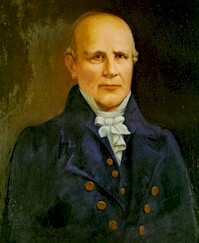 The Quids' national leader was Virginia representative John Randolph of Roanoke, who remained a political thorn for the administration throughout Jefferson's term. His chief deputy was Speaker of the House Nathaniel Macon of North Carolina. Although the Quids hailed from across the South, Macon's leadership made the faction especially popular in North Carolina. Macon was an agrarian who strongly believed that the strength of American society lay in the rural, agricultural existence of the majority of the people. In addition to state rights, Macon supported limited taxes and annual elections and criticized the emerging influence of the commercial classes in politics. Although from a prominent family and educated at the College of New Jersey, his outspoken endorsement of the cause of common North Carolinians, his esteemed reputation, and his generally accepted positions helped popularize the Quid faction in North Carolina. Nevertheless, the Quids never enjoyed a majority of Republican support on the state or national level. But their eloquent advocacy of traditional Republican principles, especially state rights, remained an important challenge to the political status quo. Noble E. Cunningham, In Pursuit of Reason: The Life of Thomas Jefferson (1987). Harry L. Watson, An Independent People: The Way We Lived in North Carolina, 1770-1820 (1983). Risjord; Norman K. The Old Republicans: Southern Conservatism in the Age of Jefferson. New York: Columbia University Press. 1965. Gauley, Robert D. "Nathaniel Macon." 1911. Collection of U.S. House of Representatives. http://www.learnnc.org/lp/multimedia/11370. (accessed August 23, 2012).